Edward G. "Bud" Saner, Jr. Celebrating the life of Edward G. "Bud" Saner, Jr.
Obituary for Edward G. "Bud" Saner, Jr.
Mr. Edward “Bud” G. Saner, Jr. age 38 of Wilkesboro, passed away Sunday, November 25, 2018 at Wake Forest Baptist Health in Winston Salem. Funeral services will be held 2:00 Monday, December 3rd, 2018 at Reins Sturdivant Chapel with Pastor Matthew Sherman and Elder Jackie Corpening officiating. Burial will be in Scenic Memorial Gardens. The family will receive friends from 12:00 until 1:30 prior to the service at Reins Sturdivant Funeral Home. Mr. Saner was born February 29, 1980 in Wilkes County to Edward Graves Saner, Sr. and Denise Williams Saner. He attended NC A&T University and graduated from Greensboro Tech with a degree in Musical Engineering. Mr. Saner was employed by UPS, where he received a 10 year service award. He was a member of Bible Way Church #3 in Lenoir, NC. Bud loved music, singing, dancing and playing the drums which was his passion. 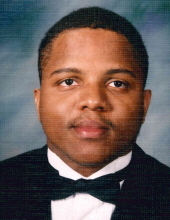 Bud was a member of Drumline Fraternity “Cold Steel ”. Bud is survived by his mother; Denise Saner of the home, a sister; Courtney Saner of Wilkesboro, a brother; Billy Joe Vaught of Lenoir and a host of aunts, uncles and cousins. Flowers will be accepted or memorials may be made to the Donor’s Choice. To send flowers or a remembrance gift to the family of Edward G. "Bud" Saner, Jr., please visit our Tribute Store. "Email Address" would like to share the life celebration of Edward G. "Bud" Saner, Jr.. Click on the "link" to go to share a favorite memory or leave a condolence message for the family.